I walked in and was instantly seated at my table, when I called to reserve the table, I was told that there was a 2 hour turnaround and that whilst my table was. Booked for 6.15, they’d need it back by 8pm – fair enough I thought! Whilst I waited for my friend to arrive (a total of about 7 minutes) I was given water and asked twice if I wanted to order my drink (rather attentive staff me thinks). It didn’t take long before we discussed the menu and whilst my friend was keen to give the elusive salt beef sandwich a go, I was quite excited about the lamb and pistachio meatballs. The menu on the whole was quite interesting with lots of random Jewish terms (“Schmear”, “Schmaltzed Radish”) thrown in for good measure. Our orders were taken and before long our drinks arrived. Ezra’s Green Rose (Hendrick’s elderflower, greengage (?!??) and prosecco) for me and the Cucumber Martini for Miss M. Although much smaller than the regular sized cocktail one is accustomed to, the flavours weren’t obstructed and watered down by a tonne of ice as is usually the case. Whilst my cocktail had a nice, subtle flavour, as already anticipated, Miss M’s was rather strong. This was even more the case given that she Was consuming alcohol on an almost empty stomach! 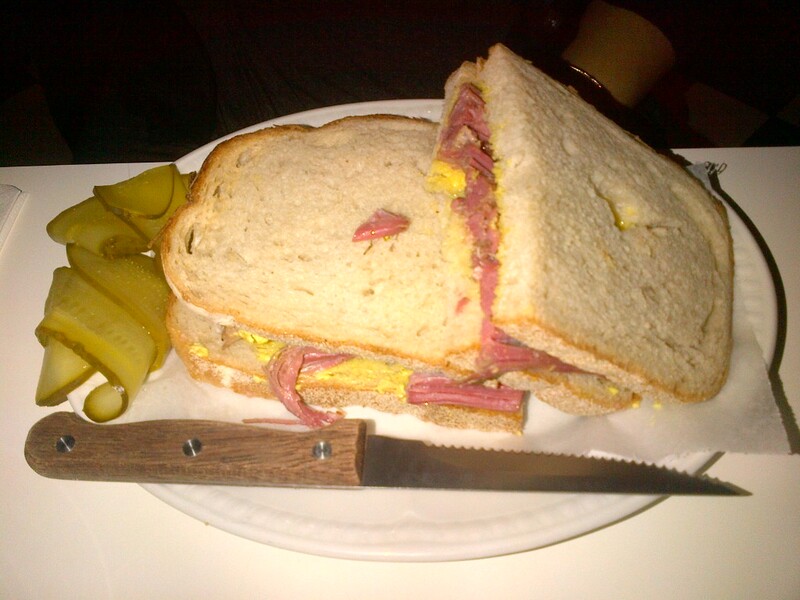 The general consensus was that Salt beef tastes like ham, only meatier. And other than feeling slightly defeated by the sheer amount of bread, salt beef and gherkins on the plate, it was thoroughly enjoyed. I not quite as bravely ordered the 3 Lamb and Pistachio meatballs with 2 sides. My sides were the cauliflower and caraway slaw and mash. 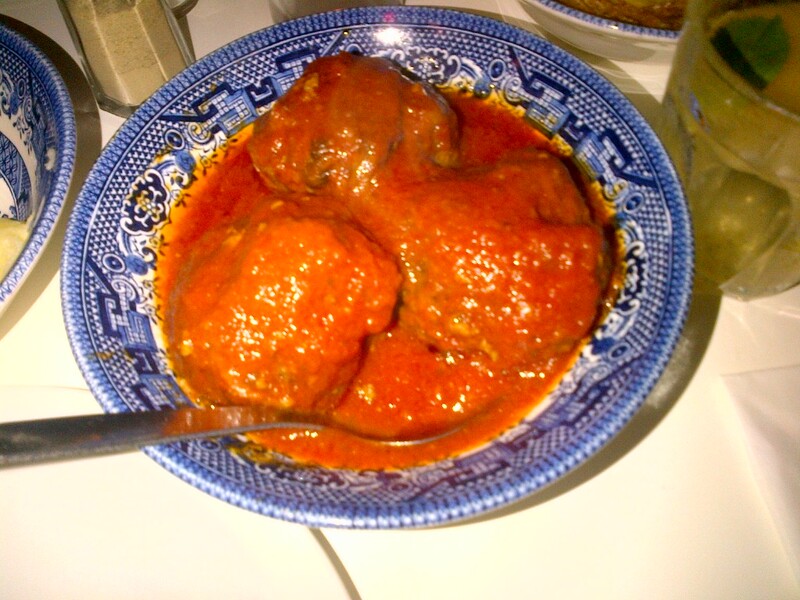 Now my mother makes a good meat ball and most Asians have a tendency to cook meat well done. These were slightly pink and were served in a tomato sauce. Unfortunately the pistachio wasn’t as noticeable as I would have liked and the meat balls lacked flavour but were nice none the less and weren’t overly heavy either. 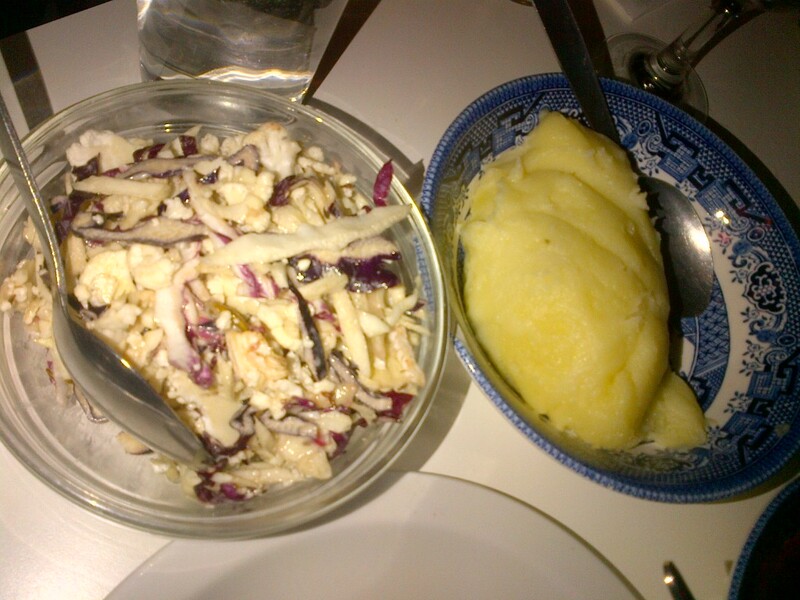 The Slaw on the other hand was extremely yummy. A mix of thinly sliced cauliflower, red cabbage and white cabbage with a very light dressing and caraway seeds, I was pleasantly surprised and will most definitely attempt to recreate it at home given the chance! The mash was creamy but not too heavy, just right! Now obviously, the cookie and lemon drizzle cake are fairly self-explanatory and the Malted Milkshake was explained to us without asking. 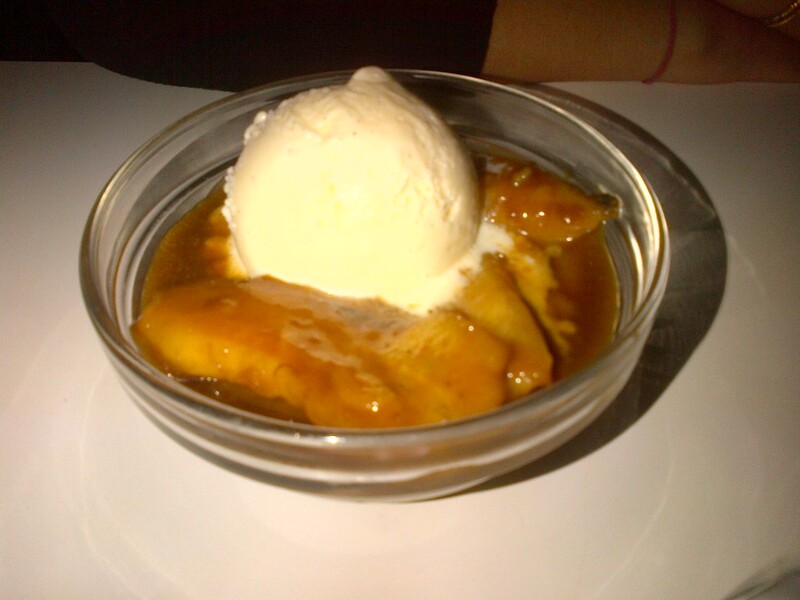 That left the Bananas Foster (Bananas flambéed in rum and topped with ice cream – described as the ultimate favourite of our friendly waitress) and the Apple & Honey Blintz (Pancake stuffed with apples and raisins, topped with sour cream and honey). After filling us in on the ‘secret club’ that is dessert at Mishkin’s, we were left to make our decision. Despite umming and ahhing for 10 minutes, we both decided to indulge in dessert. This was definitely a good choice, despite only having a taste, I totally agreed with Miss M’s comment of the Bananas Foster – Lush indeed. Sweet without being sickly, smooth and totally yummy! I have to say, after tasting the Banana Foster, I wasn’t overly impressed. The pancake was a little hard and the apple and raisin filling was a little too sweet. 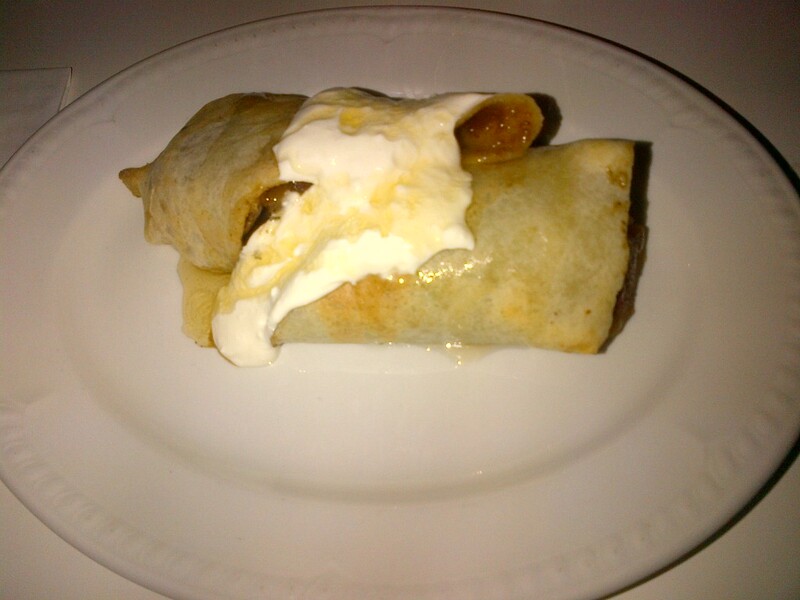 The sour cream did a good job at cutting the sweetness a little, but ultimately I wasn’t overly impressed. On the whole, I quite liked the vibe of Mishkin’s, Id say its better suited to a brunch/weekend lunch than a dinner, but we were both totally stuffed regardless. The cocktails are small but the flavours are good and not at all obscured by ice – always a good thing. I think I’d go back to Mishkin’s and maybe next time with the help of one of the friendly waitresses, I might be a little more adventurous! !